You are here: Home / Delete Social Media / How to Delete Kik Account? How to Delete Kik Account? Kik application occupies lots of space on your smartphone without providing any marginal benefit. There are lots of applications on your device that can do a lot more than what Kik does. Besides this Kik messenger is facing various controversies relating to child sexual abuse. If you feel using Kik messenger is not a decent deed, then you can delete Kik account. In this article, we will discuss the consequences of deleting Kik account, procedures to delete Kik account permanently, and steps to disable Kik account temporarily. The public name will be eliminated from Kik contact lists. You will no longer receive messages or emails from Kik. Kik username won’t be searchable anywhere by anyone. Your contact will shortly be deleted from the contact list of the persons that you have talked to. How to Delete Kik Account Permanently? Open the Kik account deactivation page from any internet browser you prefer. You will not be able to delete your Kik account through the mobile application of Kik; you have to use internet browser. Enter the email address you have used while opening Kik account and click ‘Go!’. An email will be sent to the email address that you have provided. If you don’t have access to your email that you have provided while opening Kik account you will never be able to delete Kik account permanently. In case you have forgotten the password of the email account try recovering the password first before proceeding to delete Kik account. Otherwise what you can do is: change the email address attached to your Kik account. Open your email. At the bottom of the email that you have received from Kik click on “Deactivate Account”. This will permanently delete your Kik account. In Kik, Deactivation and Permanently deletion of account are same. In case you want to take a temporary break from Kik account and intend to return to the account without having lost any data then the best option for you is to deactivate Kik account temporarily. How to disable Kik Account Temporarily? Visit the page “Deactivate Kik Account Temporarily” on any internet browser you prefer. You will be asked to enter the email id that you have used while signing up Kik Account. Check your email. 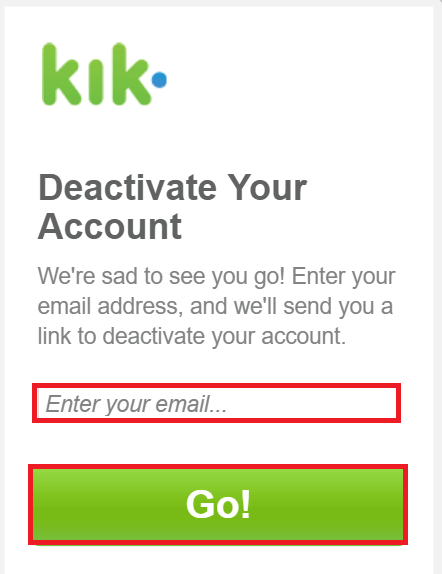 At the end of the?email, you will see the option “Temporary Deactivate Kik Account“. Click the option, and you will be asked to re-enter your password before your Kik account is deactivated. You will no longer receive messages, and you are not searchable until your account remain disabled. However, you can reactivate your account anytime you like. All you have to do is log in with the same username and password. You will not lose any of the previous data in temporary deactivation of Kik account. How to Delete Tinder Account?